Southern style potato salad recipe with mayonnaise, a little mustard, pickle relish and boiled eggs. Now, this is a recipe that will likely start a riot. Just like with cornbread dressing, macaroni & cheese and sweet potato casserole, every Southerner has their own version. And if yours doesn't taste like ours, we probably won’t like it. This is how I like my potato salad. I talk about this in the recipe, but I like mine where you start with large cubes of cooked potatoes then mix the crap out of it until you’re left with cubes half the size of what you started with because the outer sides have “mashed” into the salad. I really hope that makes sense. Half of you are nodding your heads dramatically, mumbling something like, that’s right, gurl… mmmm-hmmmmm... that. is. right. The other half are spitting on the floor. I also like mine warm so I make it at the last minute so I don’t have to put it in the refrigerator. I also don’t like a lot of tangy mustard taste. And I dang sure don’t like bell peppers in it. Sometimes I like onion but I don’t usually add them because that is truly something that not everyone agrees on. 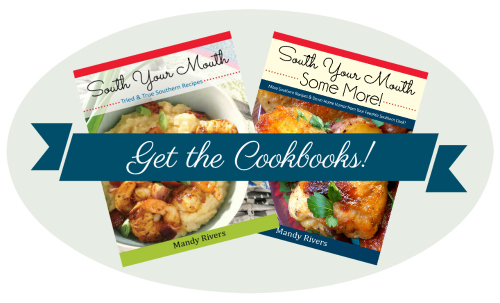 If you enjoy recipes like this, you might enjoy these too! Boil potatoes in liberally salted water for 15 minutes or until tender. Add potatoes to a colander and gently rinse with cold water. Drain thoroughly. Add the potatoes, chopped boiled eggs and pickle relish to a mixing bowl; set aside. Combine mayonnaise, mustard, salt and pepper in a small bowl then whisk until thoroughly combined. Add mayonnaise mixture to potato mixture and gently fold until all ingredients are thoroughly combined. I like mine on the “mashy” side so I get a little rough with mine but if you like a firmer texture, go easy. Refrigerate until ready to serve. *I like starchy potatoes for potato salad because I like smooshy, mashy potato salad (where it’s like a cross between chunky mashed potatoes and potato salad). If you like firmer cubes that will keep their shape better, use 8-10 medium Yukon Gold or red potatoes and cut into 3/4-inch cubes. **I don’t like “soupy” potato salad (like the kind in the grocery store delis – blech!) so I don’t go hog-wild with the mayo. If you like yours creamier, feel free to add more mayo as needed. 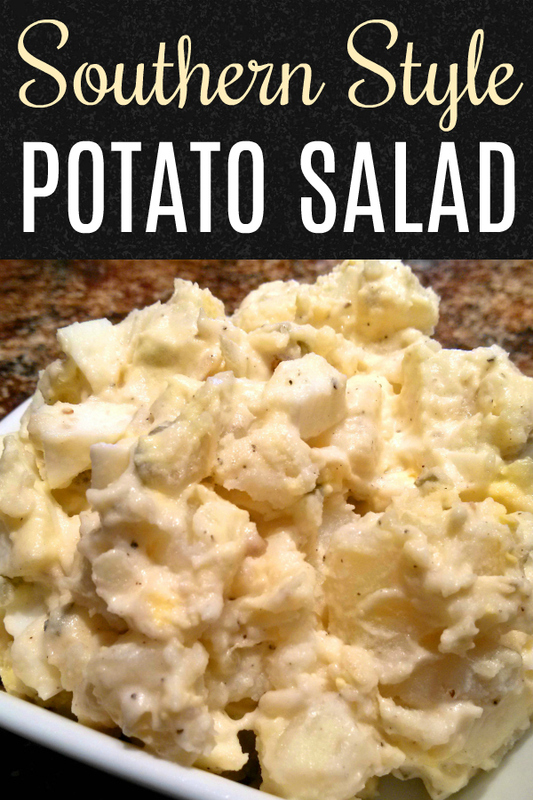 I make my potato salad just like this; however, I add crumbled, fried bacon...over-the-top! I marinate my potatoes in oil vinegar and green onions while they are hot. I could eat it like that, but then I add mayo and eggs, it is devine! I also like the half whole/ half smashed potatoes too.... YUM. That does sound good! I "marinate" my hot, cooked chicken for chicken salad similar to that. You speak the words my belly likes to hear! Throw in a lil bacon and this is perfection! I'M W\YOU. My kind of potato salad.Just like my Granny always made it here in Tn. OK, I'll go along with the non-mushy potatoes. I add sour cream, both mayo and salad dressing, several shots of dried dillweed, onions,S/P, hard boiled eggs, chopped celery, scant tsp sugar. Put in bowl and a small tomato "rose" in center. Before covering, drape a small celery heart over top. Why celery? I don't know, just because my girlfriend's mother did it when we went on picnics. These quantities are for five# potatoes, oh yes, skin on, preferably. Sorry, must be cold out of fridge. I just discovered this site and am having a ball reading, and probably will be copying. Just tell me it's something else like Cold Potato Summer Medley and I'll prolly love it! O.M.G. Girl, you are my potato salad kindred spirit! Yes. Yes. Yes. I make mine kind of like that , but I remove the yolks from the boiled eggs and mash them with the mayo and mustard. I don't like the taste of the yolks on their own in the salad. The yolks give the mayo mixture a thicker blend. me too and also add onion & celery. Did you know if you have FRESH eggs and put a tablespoon or so of baking Soda in the water and then boil them. shells slide off easily. Awesome idea to blend the yolks in! Will be trying that next time! I also add onion and celery, Gramms made it like that lol. I'll try that fresh egg trick too, thanks! I add green olives, sliced to mine. I take the pickle relish and 5 to 10 green olives and blend them together. Then, everything else is the same as above. I make mine almost the exact same way you do except we like dill pickle instead of sweet. Sometimes I add a tablespoon or two of sour cream. I always have a few chopped onions, celery & olives in a little bowl in case someone likes crunch. I've also added cucumber a few times. I meant i use salad cubes, because i don't like relish. I make several different pot. salads.But one that is surprisingly good,is Italian Pot.salad.I put in it,helman's mayo..small cut celery,green olives and italian seasoning(the dry stuff)....go easy on italian seasoning.You won't believe how good it is until you try it! This is very similar to how I make mine ( (I grew up adding celery too). Been reading where I have been making it all wrong because I boil my potatoes. Well I tried the other ways, & I like the way that I was taught to make it. I guess us southern girls have to stick together! This was too funny. You sound like me I only cook for myself so I make it the way I like it..
My mother added celery seed and pimentos to her salad. Topped with paprika. Fresh tomatoes are a good addition to potato salad as well. For 4th of July we made red, white, and blue potatoe salad. Same recipe but put some red onion, and some Kraft chunky blue cheese dressing and you can also add a little blue cheese crumbles. It was really good, but you must like blue cheese, obviously. I "discovered" you could also add some Hidden Valley Ranch Dressing and it tastes really good! I ran out of mayo one summer day when making my son's favorite thing...potato salad. Now he doesn't like it any other way. I also add garlic chives chopped fine, salt and black pepper and a little dried parsley along with the chopped hard cooked eggs and mayo. So I don't just use the ranch dressing but add some along with the mayo. It's different but definitely good! I use peeled potatoes, hard boiled eggs, onion, Hellman's mayo, and celery seed, and that is it! Can be served warm or cold. Heaven! I love the idea of this recipe and want to try it just the way it is written! In the past, I have marinated my cooked potatoes in a little sweet pickle juice, added a spoonful of prepared ranch dressing, a small amount of chopped pimento-stuffed green olives and a sprinkle of celery seed to a recipe very similar to yours. Mine is similar, except I melt about 1 1/2 TBS of butter, and stir it in. Makes it very creamy. The real secret to Potato Salad is mix the dressing in while potatoes are hot from boiling. The dressing incorporates into the outer layers of the potatoes making it oh so creamy when chilled. Might need a bit more dressing, but this step makes it so worth it! I have to say that this is the closest to my Grandmothers from Charleston, S.C. that I have ever seen. Thank you for introducing the world to "mashed" Potato Salad. We always loved it warm just mixed on Christmas. She never did Mustard, and added some onion. But as you said, it is all your preference and if your Mamma or Grandmother didn't make it we probably won't like it. Truth be told though, my Mother makes HORRIBLE potato salad. 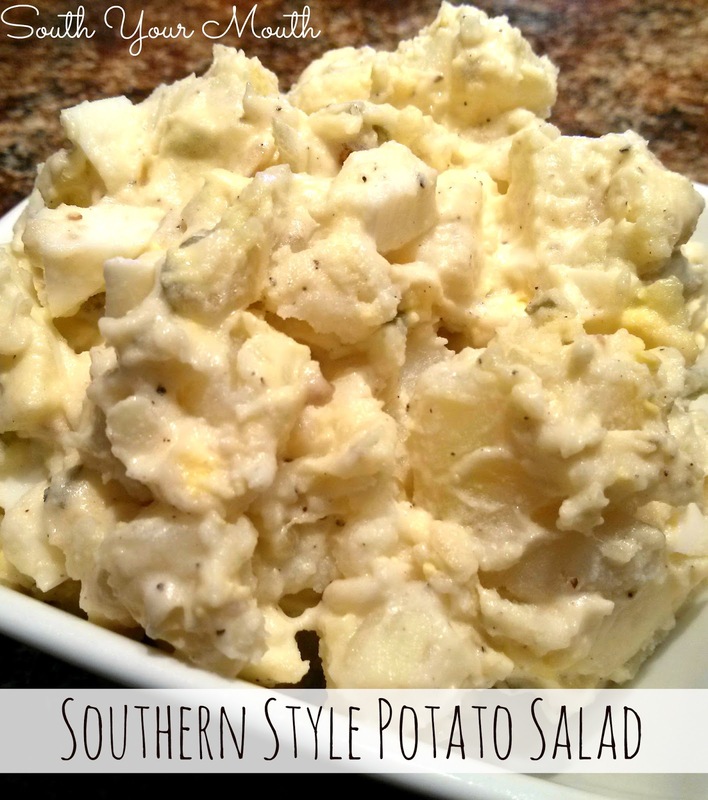 That may be "Southern" potato salad as in South Carolina, but that is NOT the way we do it in the South, as in Texas. lol Mashed potatoes, ickles, celery, onion, boiled egg, Mayonaise, LOTS of mustard and even a splash or two of vinegar or pickle juice. That's how we roll. I think I could eat yours, if the potatoes are cooked through but firm enough to hold shape. and yes to pickle juice no to straight vinegar. Our neighbor gave us some of her deviled eggs last Thanksgiving time because "no one [at her get together] touched them. I cannot think of anyone that doesn't like deviled eggs, but one taste of hers and...well I could see why they seemed untouched. They were sweet and to be honest, after reading this recipe above, I think I know what she did to them :( They were awful, none of my kids liked them not even my Aussie husband (who eats almost anything). Potato salad and deviled eggs should NOT be sweet! Potato salad should not be mushy..blllleck! Sounds like my Mama's, and what I attempt. Difference is mash egg with a fork, and use sweet salad cubes. ( I leave the pickles out of part for my brother). Also, use enough yellow mustard to color it, and get a little tang.